What a memorable weekend we had celebrating Father’s Day. Greg is just the sparkle in these boys eyes and although we try our best to show him how much we love him everyday…he definitely deserved a little extra something special for Father’s Day. 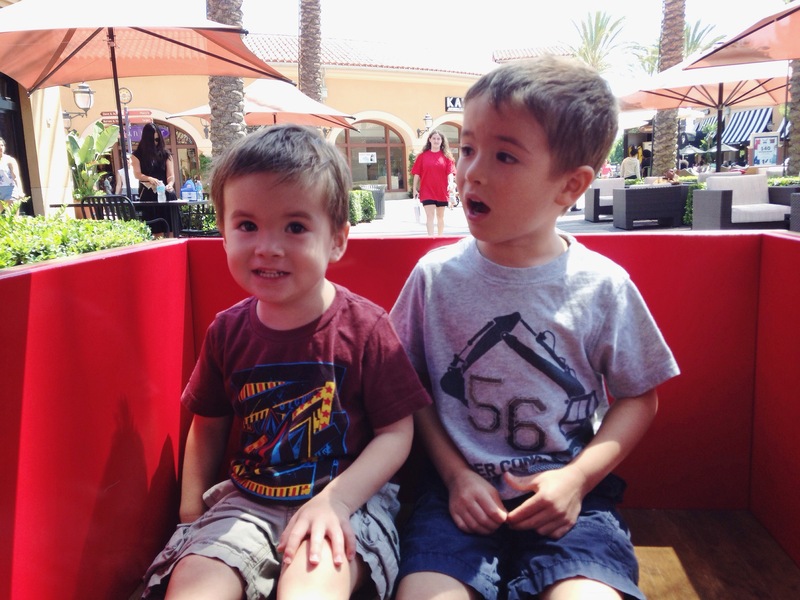 We spent Saturday walking around our favorite outdoor shopping center. 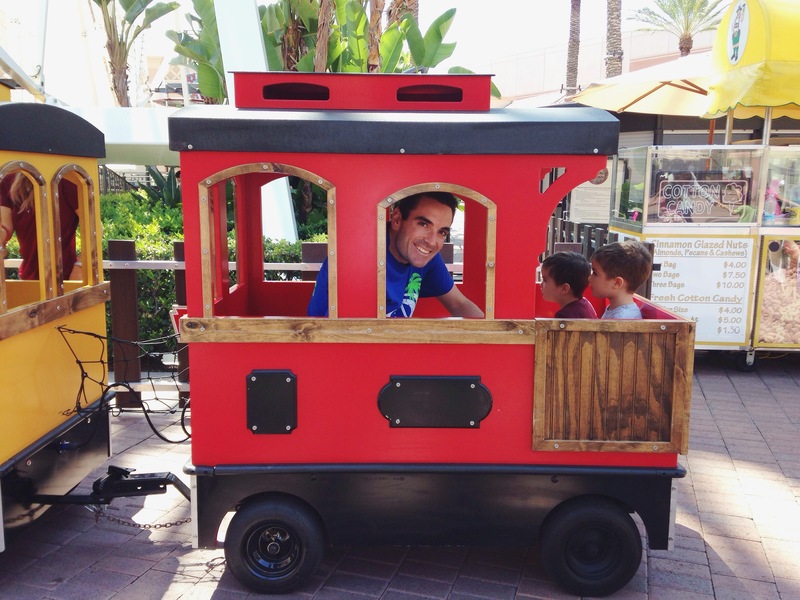 We shopped, rode the train, made wishes in the fountains, went out to a nice lunch…it was beautiful outside and it felt nice to have no agenda being there. We just wanted to stroll around and that’s exactly what we did. After we got home Shane went down for a long nap, and Nathan went to the pool with Daddy to show him his new swimming skills. When Shane woke up he spiked a fever but was totally acting fine. We stayed home and just kept it low key playing in the yard the rest of the evening and I went to bed praying Shane wouldn’t be sick the next day for Father’s Day. Nathan and I woke up extra early Sunday morning and snuck out to get bagels and coffee for Greg. We made it home before they were awake and to Daddy’s surprise he has breakfast and presents waiting for him, and to our surprise Shane was feeling 100% when he woke up. Must have just been fighting off something. Father’s Day…game on!! We headed out early to the sporting goods store to get some fishing gear for the boys, and off to the lake we went. 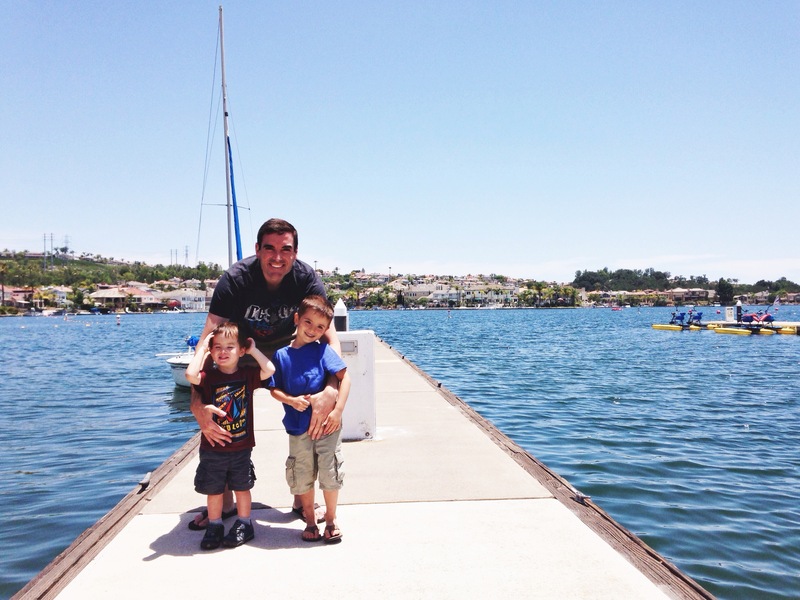 Lake Mission Viejo is 10 minutes from our house but we have never been! You have to know someone who has access to it and lucky for us my sister and her boyfriend were able to get us all in. I can’t even tell you how much we loved this place. 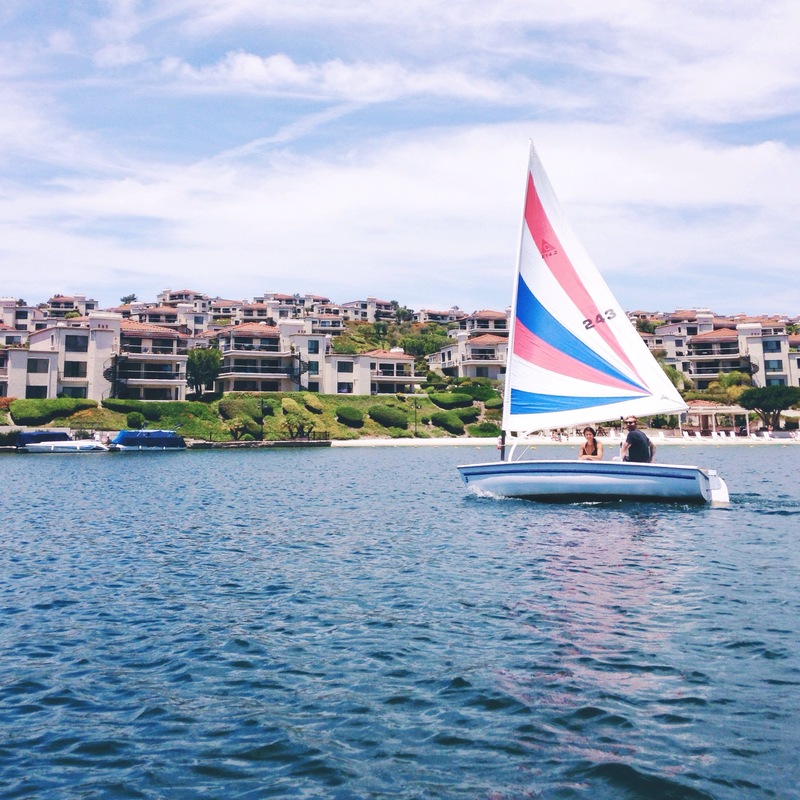 You can rent all different kinds of boats, paddle boards, kayaks, water bikes and just head out on your own for an afternoon on the water. We got a little electric fishing boat and off we went. Greg couldn’t stop saying how awesome everything was. Fishing was something that was always very special to him and his father growing up, so I know this was a dream come true for him. 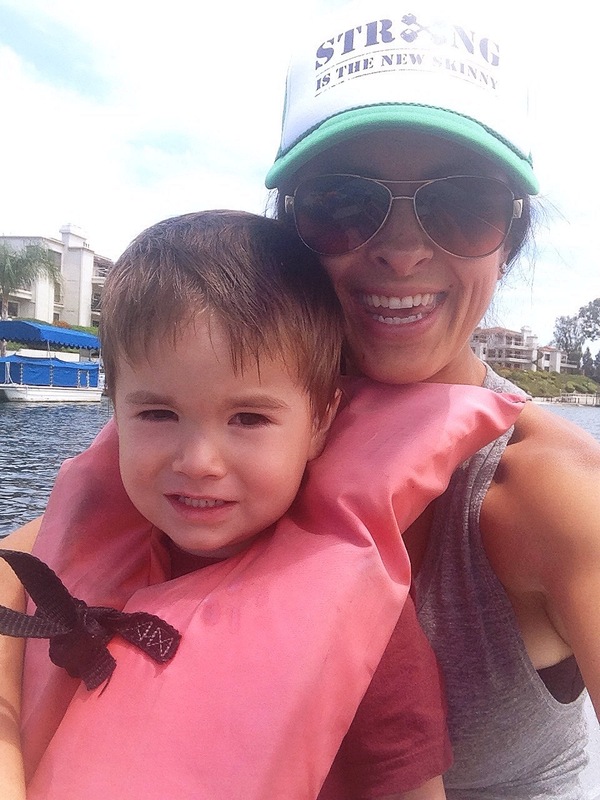 Although Shane wasn’t thrilled at first, by the end of the day he was crying when it was time to leave because he wanted “more boat, more boat! 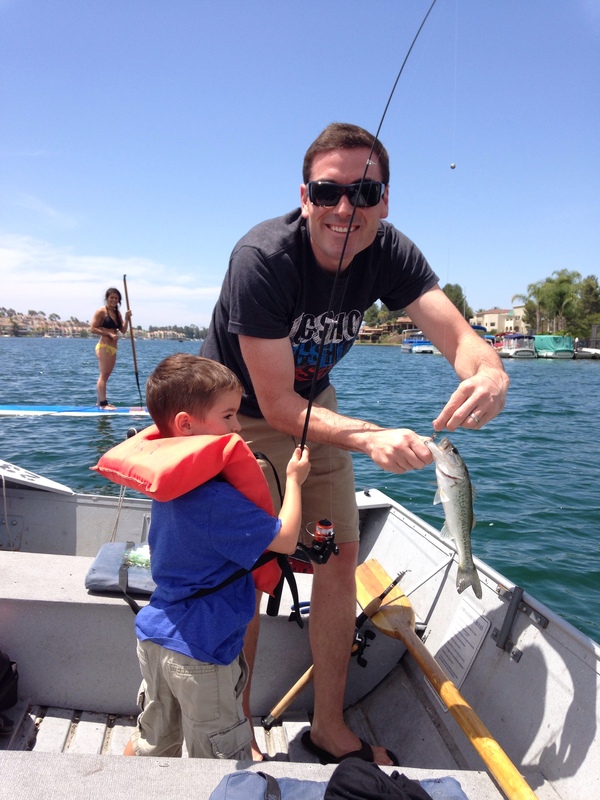 !” And the highlight of our little trip was when Nathan caught his first fish that he reeled in all by himself! Such an awesome moment that we will remember forever. 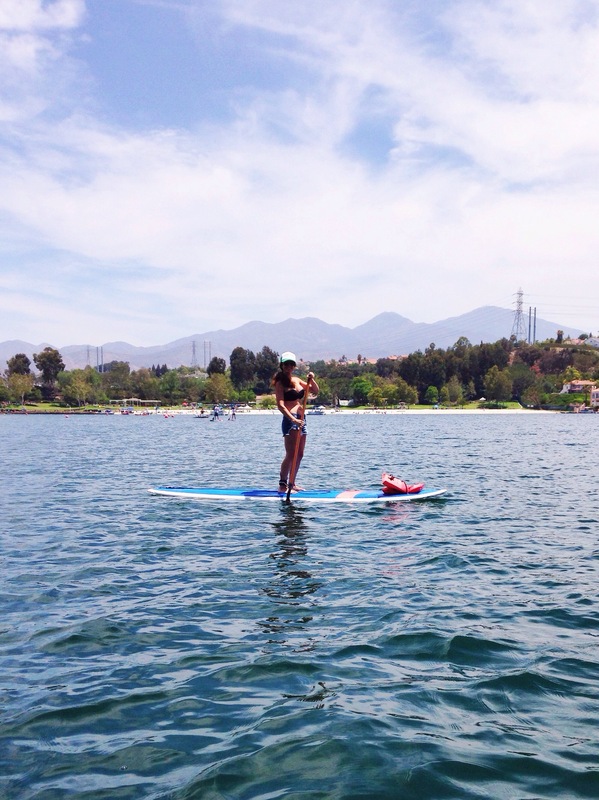 While the boys kept fishing I wanted to try out the stand up paddle board my sister was using…loved it! It was so fun to try out all their different water toys they had. Everything was between $5-12 an hour so it was so reasonable to try out everything. 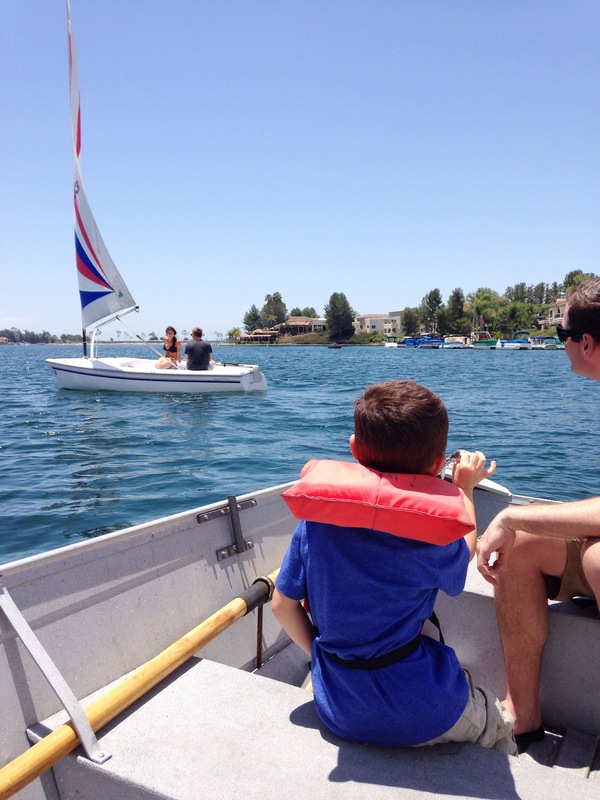 As you can see my sister and her boyfriend made a switch from paddle boards to a mini sailboat. Greg and I can’t wait to go back for a date night on one of those! 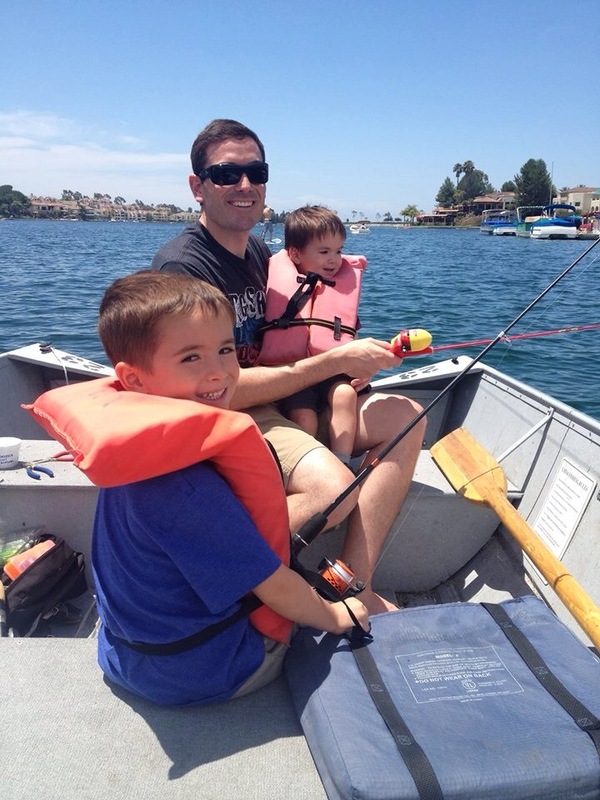 Fishing is a patient sport…and patient isn’t a word you would use to describe a 2 and 4 year old boy. It was so fun while it lasted but we called it a day after a couple of hours on the water. 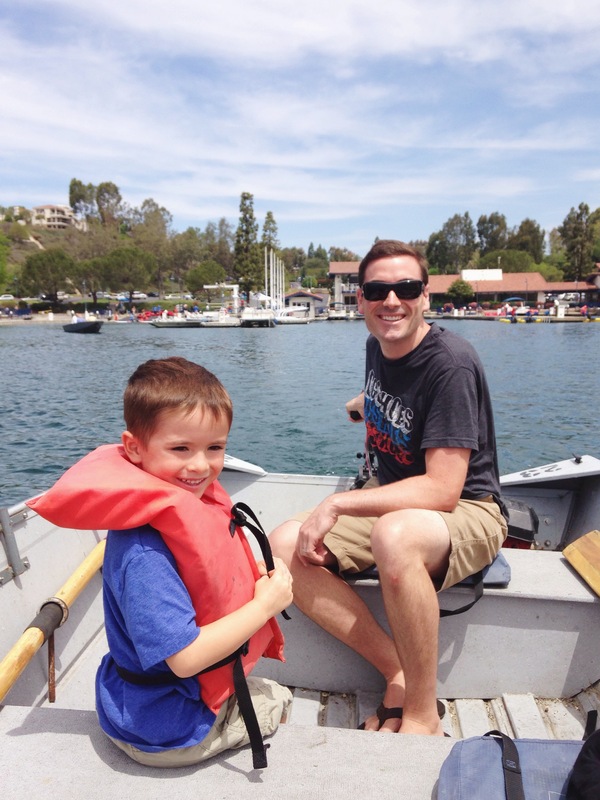 I think Greg definitely got a taste of what it will be like when the boys are older and is looking forward to days out on the water together. 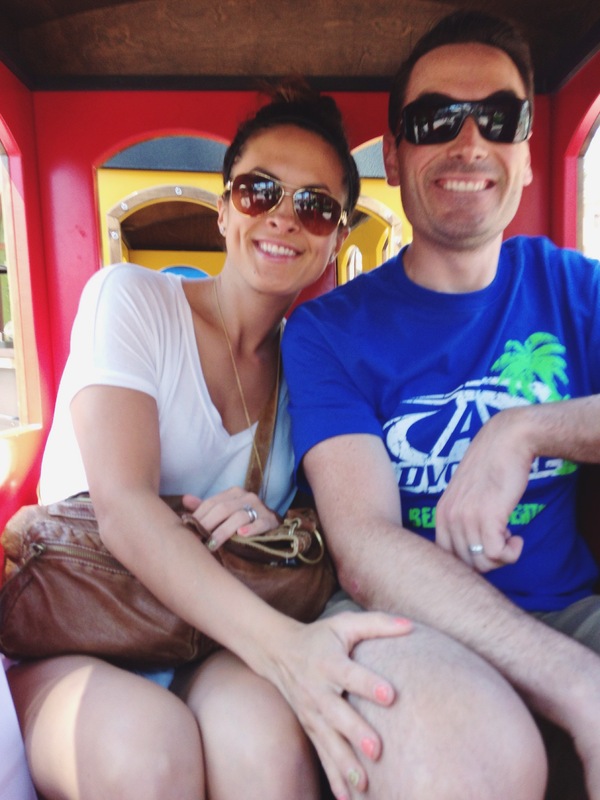 Daddy….you are our world and the boys and I are so thankful for all that you do for us. Our favorite time of the day is when you get home from work and the three of us come barreling down the driveway yelling DADDY!! I am happy because I know you will step right in and take over for the night and the boys are happy because their hero is home. You wear many hats….business man, husband, friend, brother, son but the one that looks the best on you is Dad! We love you and hope you know that Father’s Day is just one of the 365 days of the year that we celebrate you! Their hero. That is the sweetest sentiment. Looks like a fantastic weekend! This looks like a perfect weekend! 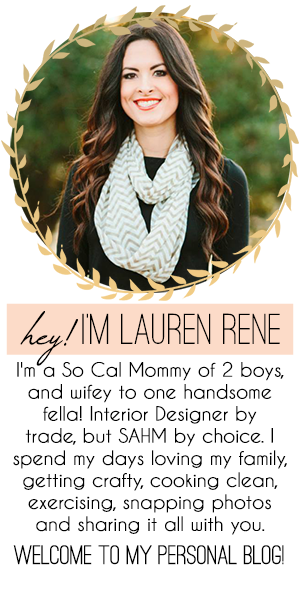 oh my goodness – so much cuteness in this whole post. sounds like a terrific day. 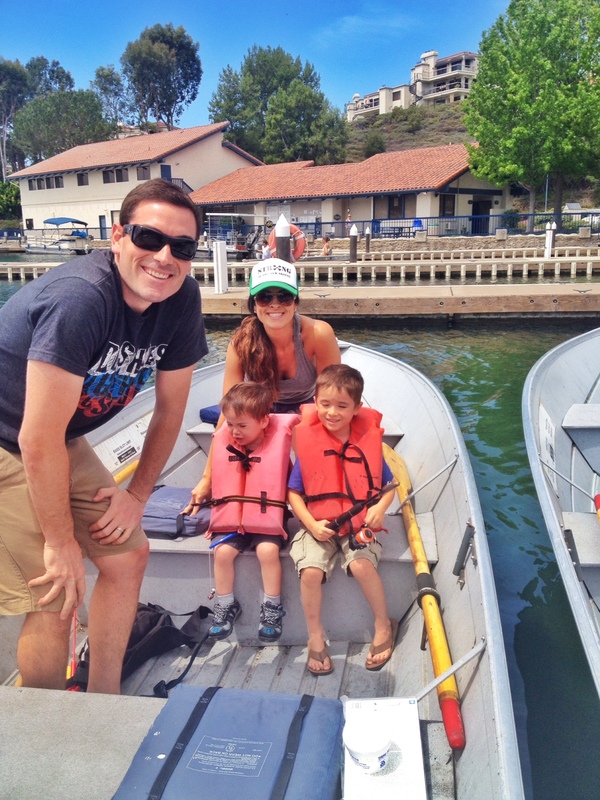 Love days like this with my family – creating so many memories.